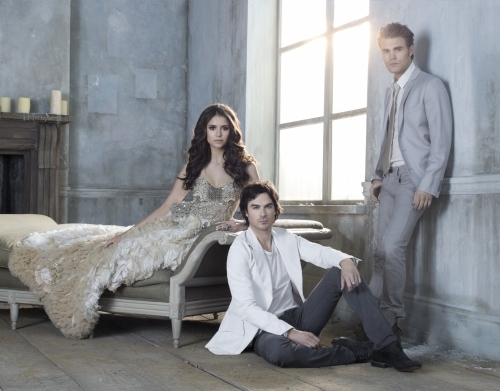 The big Season 3 premiere of The Vampire Diaries is getting closer and closer! On September 15 the madness begins all over again and to get us really excited for what’s to come the CW and producer Kevin Williamson have shared some goodies with us – like a Season 3 promo, the premiere episode synopsis and a little bit of news on Tyler, the resident werewolf. “On the morning of Elena’s 18th birthday, Caroline is busy planning a party, but Elena is focused on searching for any clues that might help her discover where Stefan is. Damon is also searching for Stefan, while trying to protect Elena and keep her from doing anything that would draw Klaus’ attention. Meanwhile, Klaus and Stefan are busy trailing a werewolf named Ray Sutton. Now working at the Mystic Grill along with Matt, Jeremy is struggling to understand why he keeps seeing the ghosts of Vicki and Anna since he was brought back to life by Bonnie’s magic. Meanwhile, Alaric does his best to watch over Elena and Jeremy, while dealing with his grief over Jenna’s death. Yay! Judging by the synopsis it’s going to be one action-packed and dramatic episode. I can’t wait to find out what this challenge Caroline and Tyler are facing. Hmmm. I’m not so sure about another love triangle, but the show hasn’t disappointed me yet so I’ll just have to wait and see how it all plays out. What do you guys think? Are you excited about the upcoming season?